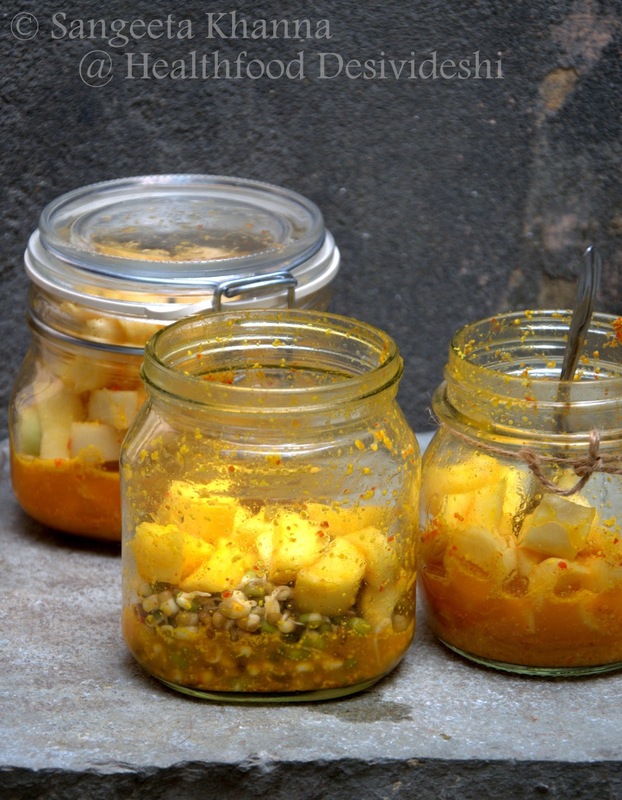 Mooli ka achar or white radish pickle is a nice pickled salad that can be compared to kimchi and saurekraut in it's taste and pungency, as well as in it's probiotic food value. The taste, sourness and the pungency differ with the vegetables and spices used in all these pickled/fermented veggiess but the 3-4 days minimum of fermentation ensures a good dose of probiotic activity in these sour condiments. Strangely, I realised the probiotic value of these traditional foods later in life when I worked with microbes myself. Before that this mooli ka achar was a yummy pickle that my grandmother used to make almost every week and we used to finish it within a couple of days. I remember how a jar of this pickle used to constantly pulled back and forth on the dining table, at dinner time and on weekend lunches. These were the times when the family used to have meals together. 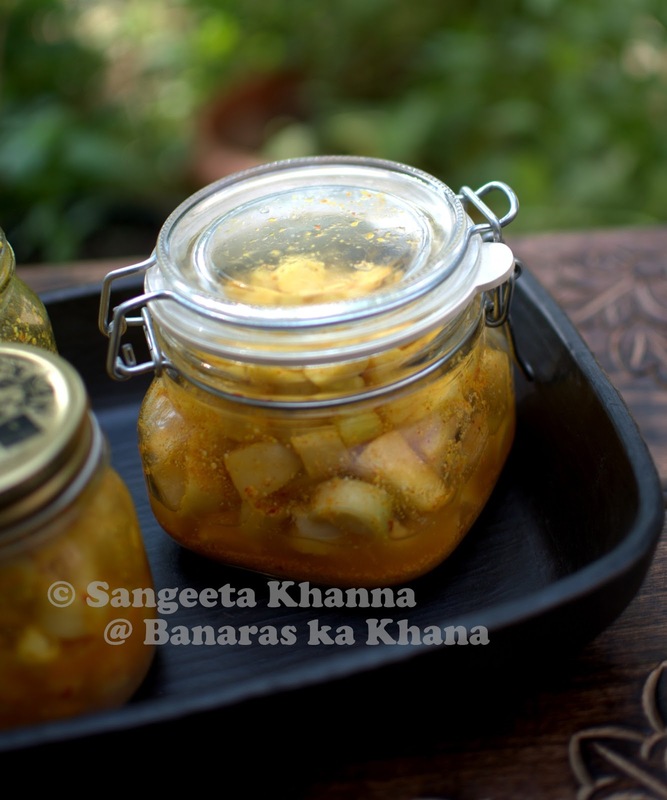 How I remember my grandmother whenever I make these pickles and chutneys, the way she used to chop the vegetables and work with them with utter patience. Almost like a meditative activity. I used to make this white radish pickles and a few more seasonal vegetables pickles about a decade ago when I was overenthusiastic about trying out everything that was cooked back home, in order to remind myself the taste of home. Arvind was not much eager to try new flavors back then as he was grown up on more bland kind of foods. He was totally dependent on milk and other milk products, all types of sweet foods like halwa, pancakes, home made laddu, horlicks, smoothies, shakes and kheer. Yes, he was someone who could have halwa or kheer for a meal, horlicks and bananas for breakfast and parathas for meals in between. A lot has changed since then and he has started enjoying the other flavors and textures more. Good for me as I need variety all the time. So somehow this pickle was forgotten over time. This year we had a lovely crop of mooli in the garden, it was wonderfully soft and crunchy and I would love to just have a large mooli for snack sometimes. The joys of having a fresh thing in your hands. I used the leaves for stir fries and parathas a lot. But then the problem is, such crops become ready all at once. So we couldn't consume the mooli as it kept getting fat everyday and soon we saw it started bearing flowers and fruits as well. I was thinking of discarding all the mooli that was hard by now and that is when the mali (the gardener) told me not to throw them and make a pickle with them rather. I was instantly reminded of my daadi's (my grandmother) mooli ka achar. 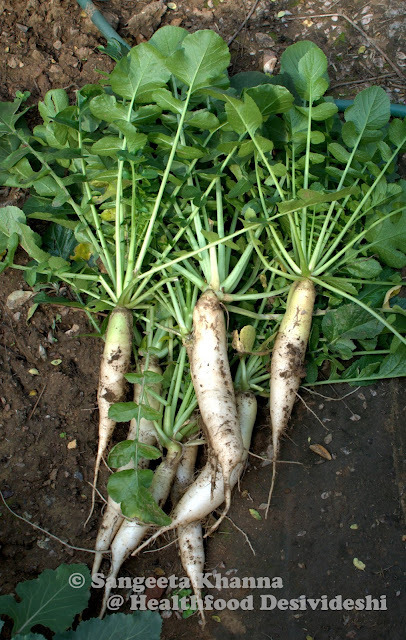 The good thing is, this pickle uses mature white radishes, the soft baby radishes don't make good pickle. So if you have a radish that has turned too tough to munch on in a raw salad, pickle it. Clean and chop the radishes the way you like. I prefer cutting them all lengthwise first and then slicing them all in half moons. Mix everything up and keep in a sterilised glass jar. Keep the jar on a sunny windowsill or on your terrace whatever is convenient to you. The pickle gets ready to eat instantly if you like mustard but the radish will be properly pickled in minimum 3 days and keeps well for 2 weeks. You can refrigerate after that but the taste keep getting more sour and you might not like it as much. The radish slices also loose the crunchiness over time. The radish slices release a lot of water that works like brine, it is better to keep shaking the jars once in a while to keep all the slices equally soaked. 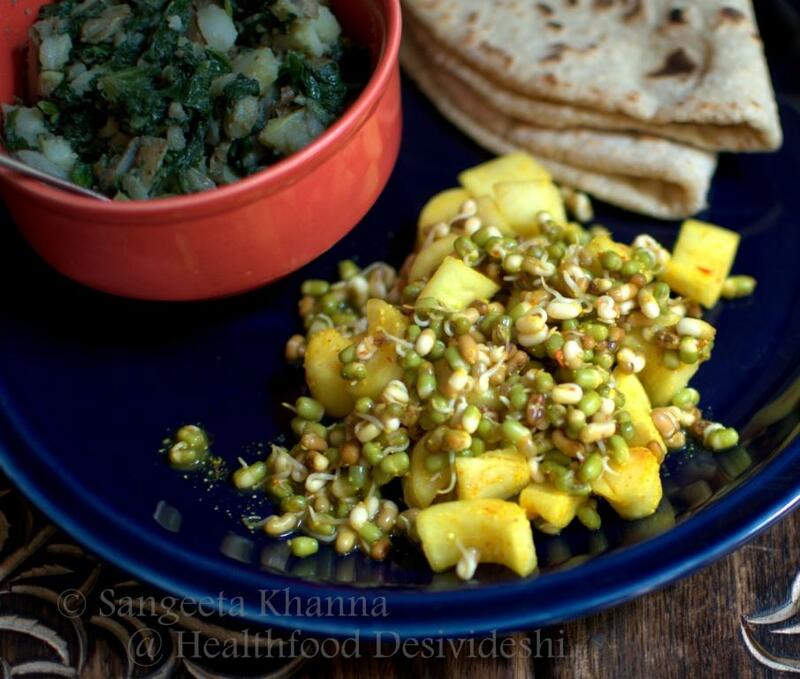 I like adding some mung and moth sprouts into this pickle and have it like a generous serving of salad with my meals. Just the sprouts added to the mooli pickle and allowed to rest for about an hour or so. This salad makes a nice lunch box salad as well in Indian summers as it doesn't get spoiled and is cooling in nature too. 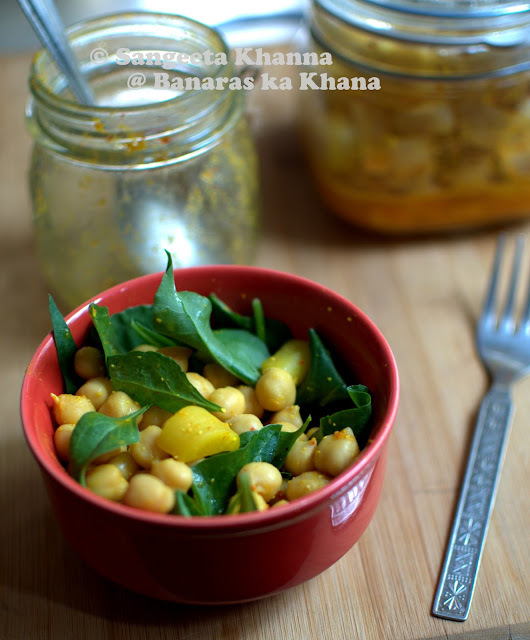 I also like to make a salad with boiled chickpeas and raw spinach leaves form the garden with added mooli ka achar. Just toss everything up in the morning, keep the jar closed and have for lunch. A tangy, crunchy pickle that has a very pleasant pungency. Detoxifying and cleansing properties, affordable probiotic food and an easy condiment to prepare. That's how I would describe this pickle. Would you like to make it? geez... this seems really delicious ! I had never looked at mooli ka achaar as probiotic food. Very valuable information and these salad suggestions have simply bowled me over...i am really going to relish these. I'm really looking forward to trying this out. I'll let you know how it goes!